This idea of vote buying is the deplorable bane of Nigerian society, which our dear President Buhari has unrelentingly been fighting to wipe away. Job seekers the world over are no doubt conversant with the usual ritual, whereby application letters are first couched in suitable and empathetic phraseologies prior to their dispatch to one choice establishment or the other. The meticulous choice of who may be your Referee is the ultimate phase that wraps up the exercise. The referees are by experience seldom contacted, but when they are reached, it is intended that they effectively and positively “market” the applicant by reinforcing his credibility and further solidifying his profile. Alhaji Atiku Abubakar’s landslide victory at the recent national convention of the PDP was simply astounding, as the man just made mince-meat of his fellow contestants. He was indisputably the choice of the delegates to fly the PDP flag at next year’s presidential elections. That mandate is reminiscent of an open application to the Nigerian electorate, seeking their consent to become their President, in fulfilment of his much cherished and long sought ambition to rule this great country. For the electorate, it is the moment to demonstrate that they are truly the King Makers. This they can achieve with their Permanent Voters Cards which now wield the weighty power to validate or not the long nurtured ambition of the various party candidates. At this juncture, I recall one of those inspiring and prophetic write-ups of my favorite columnists of the Sun newspaper, only a few years ago, Femi Adesina. Today, he is plying his remarkable and distinguished career in the Presidency, as we his innumerable fans recall in vivid nostalgia the extent of his sincere efforts to guide the man Atiku, as he has simply refused to understand the psychology of the enigmatic persona of the man OBJ. We recall that Atiku had barely a decade ago decided to pay what appeared to be a courtesy call on OBJ, totally against the run of play in football parlance. In effect, OBJ had thrown in everything on Atiku from his devastating arsenal of unparalleled mischief, with a view to ignominiously ejecting the man from his Number 2 seat and finally annihilating whatever faint hope he may be entertaining for postulating as a presidential candidate. Somehow, the law in its finest hour of unbiased justice, no matter the social rung of the personae dramatis, refused to fall for OBJ’s antics and extricated Atiku from what looked like an Iron Cast plot to oust him. The journalist in Femi Adesina, as a mirror of his readers’ opinion was wondering what could be the anticipated gains Atiku might be nursing in wanting to undertake this rather perilous visit. Alright, just a few weeks before the PDP national convention that crowned Atiku as the PDP flag bearer, OBJ came out with a most damning outburst, that God Almighty will never forgive him, if he should recommend Atiku to Nigerians for Presidency of this country. Atiku was treated as the luciferic evil that should never dare God or worse still like a ravaging plague that must be dreaded by all means. Now, one is constrained to ask why Atiku again, even while savouring the resounding victory of a TKO bang over his fellow contestants, would want to post OBJ’s name as his referee, on an all-visible and imaginary gargantuan billboard. How come Atiku deemed OBJ his choicest nominee as referee vis-à-vis the teeming Nigerian populace, who were just about to open his metaphorical letter of application for the highest job in the land? With OBJ’s brand of equivocal and inchoate referee, should applicants in general not forget about the citing any referees. Nevertheless, the truth remains that OBJ knows Atiku more than anyone else, having been his boss for a period of eight uninterrupted years however bumpy. There is this common adage that the Leopard can never change its spots, because of the ingrained DNA for that genetic phenotype. For any close observer of the last PDP convention in Port Harcourt, Rivers State, it was glaringly evident that Atiku believes in the power of money not rhetorical political persuasion, to buy his way out of any intricate situation. We are informed that while the Rivers State Governor, his friends and political soul mates were rooting mainly for Tambuwal and other contestants, Atiku the inimitable bride groom reached out for his deep wallet and was pushing into the delegates’ pockets that made nonsense of any level playing field. You can trust Nigerians, as some delegates were prompt at reaching out for their calculators to roundly confirm the incredible bonanza playing out before them. I am sure that many of the delegates might have pocketed the Dollars and Naira alike, whether from Atiku or any other contestants. The derivable lesson is that you never dare Atiku in terms of monetary strength. But this, is unhealthy for the nation’s body polity. 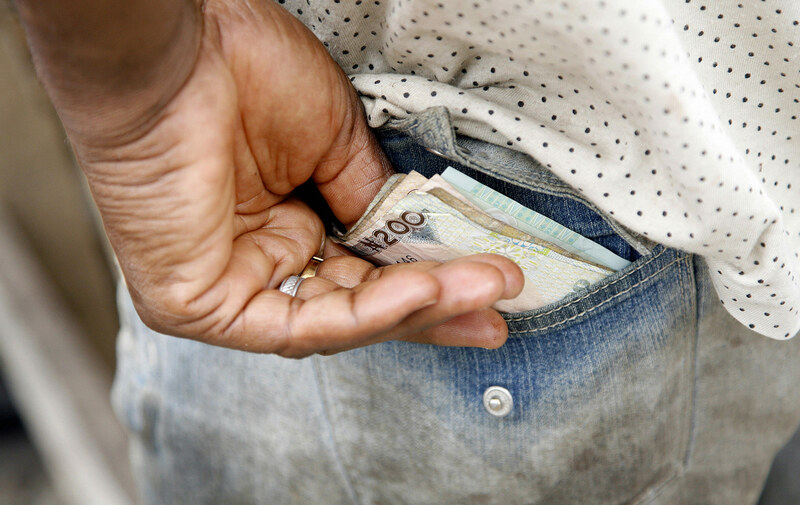 In fact, this idea of vote buying is the deplorable bane of Nigerian society, which our dear President Buhari has unrelentingly been fighting to wipe away. I am wondering if the EFCC should not be drafted into this matter to serve as lasting deterrent to shameless and open peddlers of corruption. Corruption is so hydra-headed that it promotes in-egalitarianism, demotivates the common man, while stunting developmental growth. Please go to the Oncology (Cancer) department of the UCH Ibadan and witness for yourself the rampaging horror of cancer. The only functional Radiotherapy machine in the UCH breaks down on a near weekly basis. And the machines in Enugu and Benin are either non-functional or pathetically epileptic. Where are the Dollar-rich Atikus of this world to alleviate the plight of agonizing cancer patients? Of course, those can never be PDP delegates. We salute Buhari for transforming OBJ’s and Jonathan’s hitherto unreceding darkness into light. We now enjoy public electricity throughout the night. Cheers to Buhari, we have bidden goodbye to dehumanising heat rashes, as our fans can now work. Corruption adepts of plea bargain and specialists in spurious injunctions on the EFCC should go to bed while Mr President be allowed to transform further this great country in just four more years. Their impatience to come back and resume their impoverishing pastime of heartlessly looting us dry must be resisted. The Metuhs who are today on faked wheelchairs must not be allowed to spring up and then race faster than Usain Bolt to collect easy money. It’s worthy of note that the current administration has transformed our comatose railway system into a thriving and effective mode of travelling. Some of our children born twenty years ago who had watched our rail tracks transformed into tomatoes and carrots trading posts have followed with admiration the efforts of the Buhari government to revamp our rail system. And characteristic of his legendary thoroughness and holistic approach to issues, he has not forgotten the Maintenance and Sustainability components of the rail system contract, as young Nigerian graduates are today in China, studying the various aspects of the rail system already installed in our country in order to avert any slavish dependence, when the Chinese might have left the shores of our country. Please let us keep the merciless looters at bay, and allow this Government to continue the good job we are already witnessing. Our President should continue to plug all the holes for the gathering locusts who may next time progress to campaigning with British Pounds and Euros.